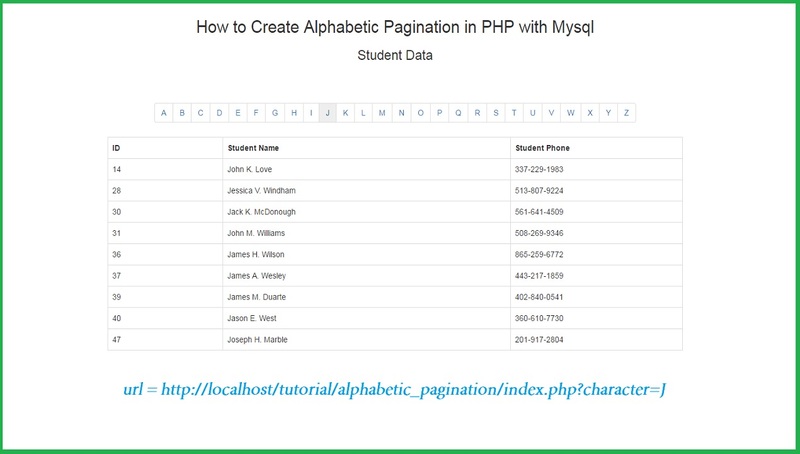 Hello friends in this tutorial we are going to discuss how can we create alphabetic pagination or sorting of data by using php script with mysql database. If you are looking for alphabetical pagination tutorial in php programming language then it is the best tutorial for learning this type of things. Alphabetic Pagination means we can filter data based on alphabetical character. By using Alphabetic pagination we can quick way to filter data from mysql table by using click on alphabet link and by clicking on that alphabet we can get filter data that start with that alphabet. For alphabet pagination first we have to define table column, based on that table column data will be filtered. Suppose in we have define student name table column, then when we have click on a alphabet link then we can get student data whose name start with a alphabet. This way we can easily filter data based on alphabet data. Here when we have click on any alphabetical pagination link then url redirect to index page with one url variable and from that variable we have filter mysql data based on that url variable and we have load that filter data under html table. This we can easily filter records based on it's alphabetical order. An alphabetical pagination also an index page of any bunch of records. So we can get any records based on it's alphabetical order. The main advantage of alphabetical pagination we can easily filter large amount of data based on it's alphabetical order. So friends this is my tutorial on how to create alphabetical pagination in pagination script with mysql database.